Infighting over how much spending to cut for social welfare programs plagues progress. WASHINGTON — As their counterparts in the Senate struggled Tuesday to advance a high-profile health-care bill, House Republicans confronted their own critical failure to agree on a fiscal 2018 budget resolution. Passing a budget is about much more than next year’s spending for Republican lawmakers. It also sets the stage for special budget procedures – known as reconciliation instructions – that will allow Republicans to pass major legislation without a filibuster from Senate Democrats. But even the promise of tax reform and long-term spending cuts has not yet been enough to bring a fractious group of House Republicans together. A scheduled Thursday meeting of the House Budget Committee to prepare a budget resolution for a floor vote was canceled Tuesday amid continued infighting. House leaders struck an optimistic note last week after Republican defense hawks and deficit hawks appeared to agree on a compromise figure of $621 billion for defense spending in fiscal 2018. But another thorny issue has derailed the talks: how much entitlement spending to trim from the federal budget over the coming decade. Most Budget Committee Republicans are prepared to trim $200 billion from the federal budget over 10 years, but hard-line conservatives are pushing for even more cuts to federal spending that now totals roughly $4 trillion a year. 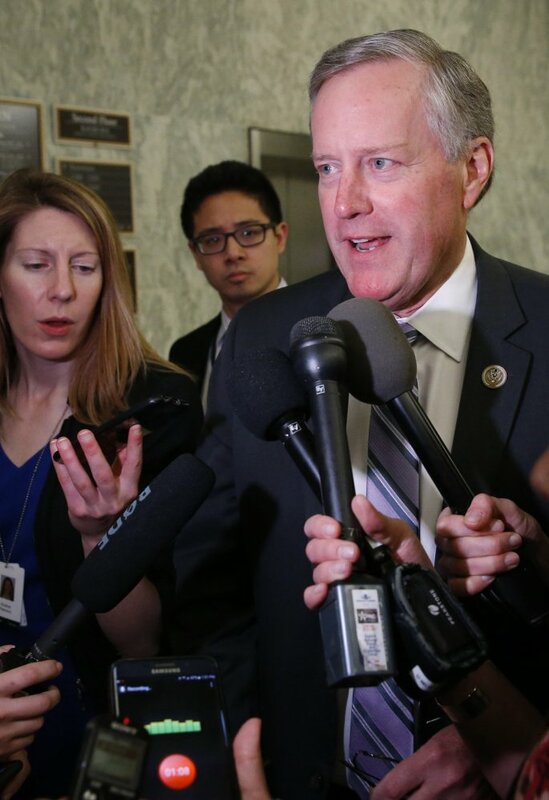 Rep. Mark Meadows, R-N.C., chairman of the House Freedom Caucus, said he has personally identified $300 billion of potential cuts to mandatory spending – programs such as Medicare and Medicaid that are not appropriated on a regular basis by Congress. In particular, he said, conservatives want cuts to the federal Supplemental Nutrition Assistance Program – food stamps – as well as Temporary Assistance for Needy Families, the main welfare program. “To suggest that there’s no waste or inefficiencies in those areas would defy history,” he said. But the chairmen of the House committees that would be charged with wringing out those inefficiencies are balking at being essentially ordered around by the Budget Committee, and that has talks in a fresh stalemate as a week-long July 4 holiday recess approaches. Under the typical yearly budget cycle, the House and Senate pass a budget resolution by April 15. House Minority Leader Nancy Pelosi, D-Calif., on Tuesday attacked what she described as the Republicans’ fiscal irresponsibility.